I remember seeing lists of books in magazines that were deemed appropriate for “summer beach reading,” the assumption being that we all deserved a break from heavier reading material during the summer. I like that idea, in theory. But the truth is that I read what I read whenever I encounter it. So my summer reading so far, has had a more serious focus. 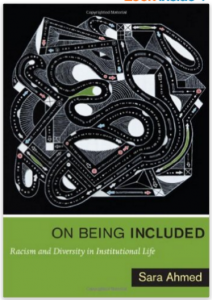 I had lunch with my friend Natalie who recommended the book On Being Included, Racism and Diversity in Institutional Life, written by Sara Ahmed. And so the beach that I’ve parked myself on is by the “sea of whiteness” that Ahmed speaks of. I think there’s a strong possibility of sunburn. Ahmed discusses her own experiences and those of her colleagues, when arriving in a room of white people, of being noticed upon arriving because of visible difference. “When an arrival is noticeable, we notice what is around. I look around and re-encounter the sea of whiteness” (Ahmed, 2012, p. 35). When I read her words I was conscious of the places and situations when I haven’t looked deep enough below the surface of presumed good intentions put forward by institutions. “People of color are welcomed on condition they return that hospitality by integrating into a common organizational culture, or by ‘being’ diverse, and allowing institutions to celebrate their diversity” (Ahmed, 2012, p.43). I think that Southwestern College can only benefit when our “diverse” students question our own organizational culture, what we teach, how we teach, what we believe about healing, therapy, and art making. And even in writing this sentence I’m placing the burden of my learning, on the “diverse” students. Honestly, though, I don’t know what I don’t know. At the same time that I was doing my “beach reading,” I experienced several small moments of conversation and memory that felt synchronous in light of what I’d been thinking about. In one week, I had a difficult conversation with my partner who is Hispanic about our perceptions of racism at a local restaurant; I also had a surreal big-box-store shopping moment; and I had a conversation with my daughter while straightening her hair. The difficult conversation was about me not seeing a waitress as being dismissive to Joey because he’s Hispanic. Through my (white) eyes I saw a waitress being rude in general, without a reason that we could know. Except that Joey has known this behavior from others, over and over again. The big-box-store adventure involved me shopping for a birthday present for my son’s girlfriend’s daughter, who has some Mexican heritage. As I wandered through the doll aisle I was trying to find a beautiful brown princess because I’d heard that she likes to play princess and I can’t ALWAYS be that person who buys art supplies for kids for birthdays. The further down the aisle I went, the more disoriented I became: “I must be in suburban Wisconsin because all I see are blonde Barbies.” But this really was Santa Fe and the row of dolls was alarmingly pale. I admit to having some doll issues. I made sure that my daughter had every African-American version of whatever doll was popular in the 90’s. And one day at the mall when I resorted to toy bribery, she fell in love with the ugliest white baby doll you’ve ever seen. All summer long she dragged it everywhere we went, much to my embarrassment, and I was too clueless to see that perhaps she had just recreated her own experience of momma and baby not matching. The hair-straightening conversation echoed hundreds of those conversations that Grace and I have had over the years. No one wants a white woman opening a hair-relaxer kit. But I’ve developed some skills. As I worked on her hair we reminisced about the time I burned her ear, and the time the goopy stuff dripped all over both of us. We talked about how long her hair was getting and it made me think of a school essay I’d proof-read for her. In the essay she wrote about what she had dreamed of wanting, as a child. Grace had dreamed of having “hair that moved in the breeze” like her family members. I remember complimenting her on her writing and then weeping in the bathroom at her honesty. And this summer as I read the book, and experienced synchronicity in tiny lived moments, I also was participating in our art therapy program’s portfolio review process which offers me the opportunity to really see and hear students as they prepare to move forward in the program. I am so moved by their art, their insights, their honesty. Some of their stories bring tears of joy to my eyes. And some make me want to hide in the bathroom and weep. But hiding out in response to diversity issues seems to be a choice often taken by white people. So perhaps crying but not hiding, and speaking and listening is more hopeful. I don’t think I need to spend any time feeling bad about feeling bad. Which actually is another point made by Ahmed. She explores the idea that feeling bad about racism or white privilege can actually move whites to a more self-centered place, reinforcing the idea that it’s still our feelings about this that matter. There is the idea that “antiracism resides in making whites happy or at least feeling positive about being white” (Ahmed, 2012, p.169). So my plan from the beach is to continue to listen, question, and pay attention. I’m open to the learning. I’m also open to the next book I read this summer to be absolute fluff.